Suffolk County Crime Stoppers and Suffolk County Police Seventh Precinct Crime Section officers are seeking the public’s help to identify and locate the man who stole merchandise from a store in Center Moriches in August. Center Moriches, NY - December 8th 2014 - Suffolk County Crime Stoppers and Suffolk County Police Seventh Precinct Crime Section officers are seeking the public’s help to identify and locate the man who stole merchandise from a store in Center Moriches in August. 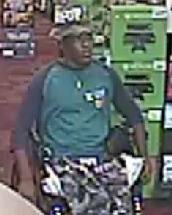 A man in a wheelchair entered GameStop, located at 512B Main Street, on August 6, 2014 at approximately 11:30 a.m. and stole an iPad. Subject: LongIsland.com - Your Name sent you Article details of "Suspect Wanted for Stealing iPad from Center Moriches GameStop"